Resignation, not hope, was the big winner in Italy’s general election. The Italian election is the latest installment of the ongoing political destabilization of the West. All across Europe and in North America, center-left parties are collapsing, popular support for the mainstream right is eroding, and new populist challengers are rising. In the last general election, when the Five Star Movement (M5S), made its triumphant appearance, Italy’s fragile two-party system broke apart. A populist formation built on hatred of the political “caste,” opposition to corruption, and a techno-utopian ideology, rose from nowhere in the 2013 contest to claim 25 percent of the vote. After last Sunday’s elections, it became Italy’s largest single party, winning 32.7 percent of the votes. The Democratic Party (PD), which led the government for the past five years, collapsed to 18.7 percent. The right-wing coalition secured 37 percent, but the results showed a radical shift in its ranks: Silvio Berlusconi’s neoliberal Forza Italia, for twenty-five years the leading force on the Right, ended up with 14 percent, while Matteo Salvini’s Lega, once a party calling for Northern autonomy but now modeled on France’s National Front , surged to 17.4 percent. Their smaller ally, the post-fascist Fratelli d’Italia (FdI, Brothers of Italy), also gained ground, claiming 4.3 percent. The other end of the political spectrum was a complete debacle. Free and Equal (LEU), a list that combined a recent social-democratic split from the PD with the small leftist party Italian Left (SI), secured only 3.4 percent, barely enough to enter parliament. Potere al Popolo (PAP, Power to the People), born from an alliance between collectives and small communist parties, stopped at just 1.1 percent, electing no representatives. The post-election landscape thus features not just a triumphant M5S but also a center-left in ruins, a radicalizing right, and an utterly marginalized left. This situation comes from the particular form of the post-2008 economic, social, and political crisis in Italy. Though not hit by sudden austerity measures, Italy’s gradual economic decline produced a mix of resignation and anger, indissolubly linked to a widespread distrust of politics that has grown ever since the scandals of the early 1990s. In this election, voters gave their disillusionment its fullest expression. Without a doubt, the Democratic Party was the election’s biggest loser. The ultimate heir to the Italian Communist Party (PCI), the PD has transformed over the last two decades first into a social-democratic and then a liberal-progressive force. With its allies, it won just 22.9 percent of the vote, losing 2.5 million voters since the last general election, despite the fact that it absorbed the free-market centrists once led by Mario Monti. The center-left’s collapse was the bloc’s worst result since the foundation of the republic in 1946. The defeat belongs first of all to Matteo Renzi, the PD’s 43-year-old leader, former prime minister, and the perfect embodiment of the center-left’s embrace of progressive neoliberalism. The first PD leader who came not from the PCI but Christian Democracy, Renzi aligned the party more with Emmanuel Macron’s centrism than with any social-democratic tradition. He’s also waged war on large parts of his party’s own base, including trade unions (with his controversial Jobs Act) and school teachers (with the Good School reform). But voters rejected his constitutional referendum in December 2016 and rejected him in last Sunday’s election. For years Italy’s media establishment glorified Florence’s former mayor as if he were the new JFK, capable of winning wide support for a modernized left, finally free of the old social-democratic dead weight. Now he has been forced to resign from the party leadership. The propulsive force of the PCI and the workers’ and democratic movement seems to be exhausted, maybe forever. In the traditional spaces of the popular electorate — in workplaces, schools and universities, social organizations, and unions — people decided, in unprecedented numbers, that they would not back “The Party” anymore. The electoral map shows the historic “red regions” of the center-north (Emilia Romagna, Tuscany, Umbria, and Marche) reduced to a handful of provinces. The center-left’s performance is another partial example of Pasokification — when a historically center-left party collapses thanks to its role managing austerity. In this, Italy follows hot on the heels of what has happened in varying degrees in Spain, France, Germany, and the Netherlands. 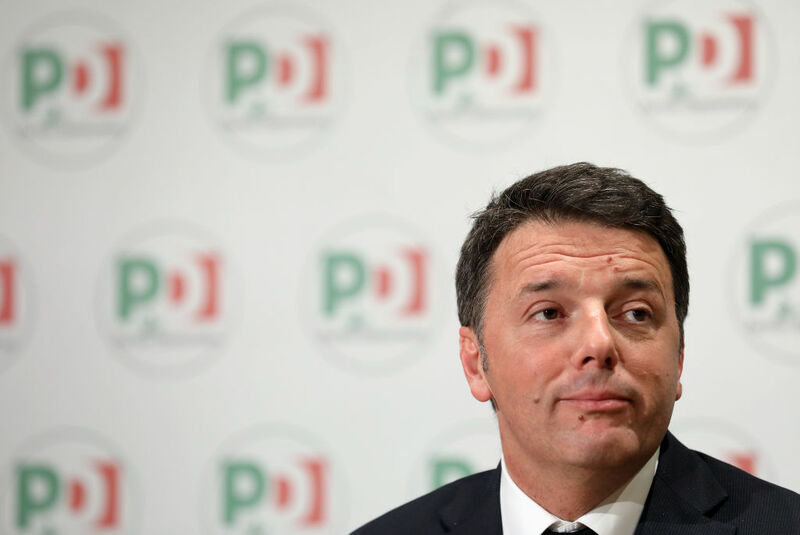 While he doubtless shares the blame, we can’t scapegoat Matteo Renzi for the Democrats’ woes. His style, which imitated Berlusconi’s personal and authoritarian form of leadership, surely contributed to the PD’s unpopularity, as did his evident contempt for his own party. But that does not explain the scale of the collapse. Most importantly, it does not explain why the voters who abandoned the PD also rejected its most direct competitor, the Free and Equal list. The small SI party and the social-democratic wing of the PD, which included former party leader Pierluigi Bersani, former prime minister Massimo D’Alema, and Tuscan president Enrico Rossi, merged to create LEU, taking Piero Grasso, president of the senate and former anti-mafia judge, as their leader. Free and Equal aimed to address the center-left voters who were disappointed with Renzi and had lost confidence in the PD. As Bersani often repeated: “Our people ran away into the wilderness, and we have to go and find them.” Unfortunately, these voters did not want to be found — at least not by LEU. The forces that shifted from the old Communist Party to the PD did not turn to Free and Equal. This should have come as no surprise: Renzi was not the only person pushing the center-left toward progressive neoliberalism. If Florence’s self-styled JFK could move the bloc in this direction, it was only because such a transformation was already in its DNA. Some of the Free and Equal leaders made a neo-Corbynite turn, criticizing themselves for their past adherence to Blairite neoliberalism, re-embracing socialist principles, and so on. They were probably sincere, but the move came too late to convince either the radical or center-left’s historic base. LEU ran on a platform that looked more like Labour’s than that of the German Social Democratic Party or the French Socialist Party, but its proposals did not seem credible to a major part of the leftist electorate. Meanwhile, despite its attempts to reassure moderates by defining itself as the “center-left” and repeating the conservative mantra “we will behave responsibly,” much of this voting bloc found LEU too similar to the usual radical left list. Winning 1.1 million votes is no small thing, considering the dark winds blowing through Europe, and the handful of MPs it elected — even if most are former PD members — will be the only contact between the next parliament and unions, social movements, and struggles. Nevertheless, it was a political failure, representing the end of a certain history. The Italian left, from its most moderate to its most radical forms, emerges from this election pulverized. As happens in the best of families, twenty-five years mismanaging an inheritance (in this case, the one bequeathed by the Communist Party) can only squander it. This gloomy picture also includes the Potere al Popolo list, created in November from an alliance between the Je So’ Pazzo social center in Naples, Rifondazione Comunista, some small communist parties, and other grassroots unions and collectives. PaP won 370,000 votes — just 1.1 percent: the worst electoral result ever achieved by the Italian radical left. The results deny PaP a place in parliament, and frustrate, at least in the short term, its ambition to become the Italian counterpart of left populist movements like Podemos and France Insoumise. Potere al Popolo suffered from its scarce visibility in a context in which the media and most voters thought even Free and Equal was a hazardous choice standing apart as it did from the three main actors competing for the victory. But this does not mean that PaP can be dismissed. PaP will hold a national assembly on March 18. Trying to become both the populist list of the majority and the militant list of radical left struggles, PaP was often forced by contingency to let the latter aspect prevail over the former. Nevertheless, its experience may leave traces. The list made the populist choice to push the traditional organizations, symbols, and discourse of the radical left to one side in favor of a participatory politics that directly addresses the majority of people — those who want a job, a house, and a pension. Likewise, PaP democratically elected its candidates, placing a new generation of activists, representative of the precariat that has paid the highest price for the crisis, at the center. It also relied on very simple and direct language. Though it didn’t pay dividends in this month’s election, it would be premature to say the effort was a total failure. Which is not to ignore the obvious — a decade of economic crisis and austerity finds the Italian left reduced to more a marginal cultural tendency than a great popular force. Italian voters’ much-dreaded turn to the right, following the United States and France, happened only to a point. The coalition between Forza Italia, Lega, and Fratelli d’Italia collected 12 million votes: more than the 10 million it secured at the peak of the crisis in 2013, but still far from the triumphant 17 million votes of 2008 or the 18 million votes of 2001, when almost 50 percent of Italians voted for the Right. Clearly, the coalition that brought Italy near bankruptcy in 2011 even as it implemented austerity policies almost as severe as those put in place by the technocratic cabinet that followed, has still not regained its popularity. Nor does the physically and mentally tired Berlusconi — still formally banned from public office due to his sentence for tax fraud — have the attraction he once did. The Right did not grow significantly, but it did radicalize. Salvini’s Lega, reformed along the lines of Marine le Pen’s National Fronts, secured 17.4 percent of votes. This radical, ultranationalist, and anti-immigration force dominated the coalition; Salvini now leads not only the Italian right but also a radical right that is reaching historic postwar heights. This success takes place just a few weeks after one of Lega’s former candidates attempted a mass shooting of immigrants in Macerata. And, the day after the elections, a Senegalese citizen was shot dead in Florence in still uncertain circumstances. While the media vastly overestimated the growth of the explicitly fascist right (both neofascist parties got less than 1 percent of the vote), Lega’s and FdI’s mainstream nativism has been significantly strengthened. The massive popularity of anti-immigration discourse— amplified by the three TV channels Berlusconi still owns — has given unprecedented coverage and legitimacy to far-right forces and their most violent expressions. A black tide is rising in Italy, as it has in other European countries, and the progressive neoliberalism of the mainstream center-left proved completely unable to stop it. Indeed, the PD’s abandonment of any fight at the level of economic redistribution opened the door for the Right, which channeled a significant part of voters’ anti-elite anger into its own crusade against immigration, Europe, and cosmopolitanism. But the Italian right did not win the elections: its 37 percent is not enough to ensure the parliamentary majority necessary for Salvini to be appointed prime minister. Instead, the M5S became the largest group in the new parliament, gaining 2 million votes since 2013. Despite losing a significant part of its former electorate to Lega, M5S absorbed most of the PD’s lost votes, winning the vast majority of constituencies south of Rome. This is the worst sign of the historical defeat of the Italian left: faced with the PD’s collapse, voters did not turn to its more or less radical competitors but to a force culturally outside the workers’ and democratic movement, outside the concepts of socialism or even progressive liberalism, a force radically critical of unions and collective organization in general. The M5S has a more widespread presence in Italy than any other force and has won support across all social strata, groups, and attachments. Its cross-class composition has been unseen since the time of the Christian Democracy. M5S has such low ideological intensity that it could attract millions of votes from the center-left and even from the traditional radical left, thanks to its vague promises of economic growth and voters’ mass disillusionment with the PD and politics in general. Not even its adoption of clearly right-wing positions on other issues, such as immigration, turned this voting bloc away. In a country with double-digit unemployment, M5S’s promise of work and a guaranteed income made a mark, especially in the South. It combined the need for government protection in times of crisis with the anti-government spirit that characterizes many Italians. Framing public life in terms of a dominant “caste” effectively directed all the anger over corruption against “politicians” while preserving the potentially positive role of the state in economic matters. It would be a mistake to characterize M5S as left or right populism, as a Podemos or a Le Pen. Rather, it came out of the peculiar way Italians interpreted and politicized the crisis. In Italy, the crisis peaked in 2011, when Berlusconi — and not the center-left — led the government. Austerity has a longer history in Italy (at least since 1992), and no mass, anti-austerity movement like the Spanish 15-M formed to resist these policies. Italy didn’t need a European bailout, and its government never had to negotiate with the troika. Instead, a whole generation has grown up believing that a former industrial power’s productive base will inevitably decline while watching two decades of corruption scandals, which destroyed the entire political class, unfold on the front pages. In this context, the M5S is the form that a political alternative takes. For the Five Star Movement, “the people” are “honest citizens,” and “the elite” is represented by the “caste of politicians.” The struggle against corruption and government waste is the main axis of its public discourse. This aligns with the party’s techno-determinist futurism, in which the internet will allow all citizens to express themselves and the hated intermediation of parties, unions, and other organizations will become redundant. The M5S expresses a calm and responsible anger. Its social conflict is delegated to parliament and does not need to take the streets. It promises to take down the government without touching the economic system. In order to chase the polls, this soft-core populism takes progressive — if timidly Keynesian — positions on economic issues and conservative stances on immigration. If we combine the M5S’s victory with Lega’s successes and the PD-led government’s defeat, the real winners of the Italian elections were the politics of resentment, of silent rage, of a rancor that does not produce conflict. But it was also without doubt a demand for change and radicalism. Dismissing the results as the advance of an essentially fascist right would be superficial, even if it does contain part of the truth. The votes for M5S also express the frustration of those who oppose the PD’s progressive neoliberalism but found no other credible alternative. In the tenth year of the crisis, as poverty rises and savings dwindle, voters are no longer content to wait for small alternative forces to grow: they want a change of government, now. Will they get it? Over the next few days, the factions will negotiate to piece together a parliamentary majority. The president, Sergio Mattarella, an old Christian Democrat of moderate leanings but solid constitutional values, is unlikely to appoint Salvini or Di Maio as prime minister without reasonable certainty of a solid majority. Nobody has the numbers to govern without the formation of a coalition. Salvini proposes to lead a right-wing government that would combine his nationalism with Berlusconi’s free-market liberalism — basically Donald Trump’s model. This proposal is very unlikely to attract M5S or PD parliamentarians, which he needs. Di Maio can choose between an anti-immigration alliance with Lega or an economic redistribution and stimulus coalition with PD and Free and Equal. However, both the Right and the center-left seem to want to rebuild their electoral support from the opposition benches rather than engage in a dangerous liaison with an untrustworthy ally. The stalemate may last for some time, and we cannot rule out fresh elections, which has never happened before. The successes of the Right and of M5S calls on Italian social movements — which have much more life than the political left — to become reference points for a larger portion of population than they usually address. Crushed by the choice between posing a populist challenge to contend with the M5S and searching for disappointed center-left voters in the wilderness, the Italian left fought on each front in this election, but neither strategy succeeded. In the meantime, something is moving: the women’s movement, the mass participation in the December 2016 constitutional referendum, the return of labor struggles (in both traditional and new forms), and the wave of anti-fascist reaction that followed the Macerata shooting. These events signal that while Italian leftist politics is motionless, society is not. For years, the M5S has anesthetized social conflict, but this situation will not last forever, especially if it ends up in government. Lorenzo Zamponi is a research fellow in sociology and political science at the Scuola Normale Superiore in Florence.